129 Law Enforcement Officers were tragically killed in the line of duty during 2017 throughout the United States. In 2017, the Beverly Hills Police received 32,446 calls for service. In 2016, there were 58,627 assaults on Police Officers nationwide. The BHPD response time to emergency calls is 2.8 minutes. On average, a U.S. Law Enforcement Officer dies in the line of duty every 58 hours. Can you imagine going to work and wondering if you’ll survive the day and see your family that night? Most people can’t. But, in Law Enforcement, this is a fact of life. Beverly Hills is known worldwide as one of the safest communities in which to live and work. Police Officers are an integral part of our community, proudly safeguarding our way of life 24 hours a day, 7 days a week. Our Police Officers are dedicated professionals who serve the residents and businesses of the City of Beverly Hills with courage and honor. 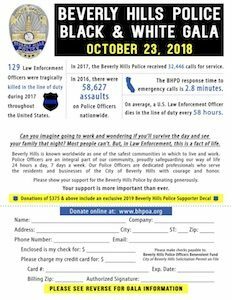 Please show your support for the Beverly Hills Police by donating generously. To donate or view information about gala tickets, journal ads, and sponsorship info, click below to view the form.